For most of its 135-year history, the University of Southern California has been regarded as a very good regional university, but in recent years the school has strived for more. Last year, USC admitted just 18 percent of applicants, while freshman SAT scores for the fall 2015 class were in the top 10 percent nationally. In just 20 years, USC has climbed in U.S. News & World Report's rankings of national universities from 51st to a 23rd-place tie with cross-town rival University of California Los Angeles. 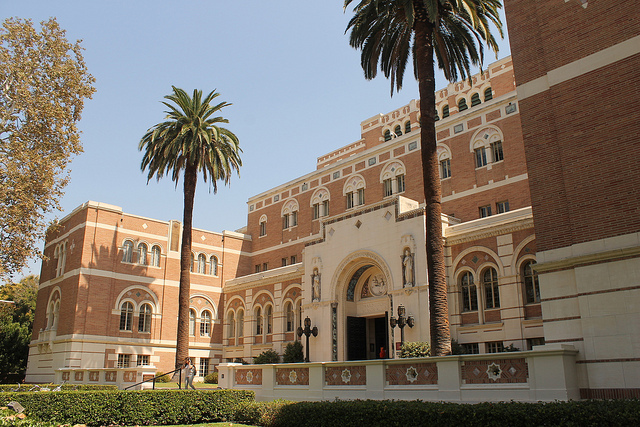 USC’s enhanced reputation has attracted top-notch researchers, which has led to greater gift giving. The most dramatic example is luring brain researchers Arthur Toga and Paul Thompson from UCLA. Their defection led to a $50 million gift from USC alumnus Mark Stevens and his wife Mary to establish the Stevens USC Neuroimaging and Informatics Institute that will look into causes, prevention and cures of brain disorders including Alzheimer’s disease and autism. “One of the things we’ve found with major philanthropists who have accumulated a lot of wealth is they’re not interested in your university, per se. They are interested in what your faculty, physicians and researchers are doing to address societal and global problems,” said Albert R. Checcio USC’s senior vice president for university advancement, speaking to Inside Philanthropy. To tap the vast sums of money it needs to keep improving, in November 2011, USC launched what was then the largest fundraising campaign in higher education, seeking to raise $6 billion by 2018. So how's it going? “We just passed the $4.5 billion mark. We’re about a year ahead of schedule. We’re cautiously optimistic,” Checcio said. If you follow higher ed fundraising, it's been hard to ignore USC's outsized fundraising success, lately. In addition to that $50 million gift for brain research, the school has brought in a string of other big gifts in the past two years. These include a $15 million gift for its accounting school, $15 million for its business school, $20 million for cancer research, $30 million for an honors hall, $25 million for its public policy school, and more. USC has moved in school fundraising rankings from 16th in the late 1990s to third last year, just behind Harvard and Stanford. So what is its secret sauce? Checio has been around higher fundraising for a long time. Before USC, where's he been for more than five years, he worked as the VP of development for Fordham University, the VP for university relations of American University, the VP for development at the Temple University Health System and as the VP for development of Children's Hospital of Philadelphia. For the USC campaign, Checcio gives a lot of credit to the leadership of President C. L. Max Nikias who has been at USC since 1991. He has worked his way up as a professor, director of national research centers, dean, and provost. “He’s a visionary. He spends a great deal of his time meeting with donors, alumni, and parents. He’s available, he’s talking about a mission. He builds a sense of pride in the alumni all the time,” Checcio said. Checcio also praised the work of his staff, which has expanded significantly. "We have grown our staff from the beginning of the campaign from about 200, to where we are now, which is 470. This is an important point: We’ve grown more efficient as we’ve grown the staff. It actually costs us less to raise a dollar now than it did five years ago. Now, we raise more money and we raise larger gifts, so our cost per dollar raised is 11 cents, which is a fantastic number for a large, private research university,” Checcio said. “We have 350,000 alumni worldwide. How do you stay connected to them? You can’t just do it through social media. You just can’t do it through the mail. You have to engage them. You have to have events. You have to go to them,” Checcio said. Since he became president, Nikias has traveled across the U.S. and abroad. On one trip this past April, Nikias, his wife, and an entourage of about a dozen flew to Houston for a three-day, three-city dash to tout USC, going so far as to enlist the help of Texas' first lady, Cecilia Abbott, whose daughter entered USC this fall. “When you’re talking about major gift fundraising, there is no substitute for relationship building. It’s all about building trust with the donors, and that takes time. You have to be patient. We never ask people for gifts the first second and sometimes the third time we meet with them. We talk about programs. We build a relationship. That’s been the key to our success for some of the larger gifts,” Checcio said. “The other thing we do is communicate. We let everybody know how well we’re doing because of their gift, whether that gift is $100 or $100 million. Now, that might sound like a slogan, but if somebody makes a $1,000 gift to support books for one student, that makes a big difference in the life of that student, doesn’t it? We tell those stories and we let people know that every gift matters, regardless of its size,” Checcio said. Of the $4.5 billion raised to date, 251,091 donors have made gifts of less than $1,000. “And I’ll tell you another reason why it matters," Checcio continued. "Almost all of those big gifts that come from our alumni started as donors to the annual fund. David Dornsife, who gave $200 million—that gift didn’t fall from the sky. David made his first gift in 1986 to athletics for $100, then made subsequent gifts all the way along, so that’s another reason why we’re so fanatical about working with people to make their first gift, or their second gift and third gift." “The most important gift is their first gift," Checcio said, "because the data tell us that giving is a habit and people give when they’re involved. You can’t show up on someone’s doorstep when they’re 55 or 60 years old and say, ‘Here we are, your alma mater, aren’t we great, and boy do I have a deal for you.’You can’t do that. You have to be with people all the way through. You have to engage them. That’s where alumni programs come in.That’s where athletics comes in." Checcio added: “Then we’re a little scientific behind the scenes, being able to determine who seems to be doing well in their career and where their kids are going. We stay involved with people so that when they get to the point where they can be really charitable and generous, they look at us, because we’ve always been there, and they’ve seen the growth." How much are bequests part of the mix? “Estate planning is very valuable when you’re talking about people who have accumulated wealth. They’re always concerned about, 'How do I preserve it, how do I pass it along, and be charitable with it,' so you have to be somewhat sophisticated, because often, you’re dealing with sophisticated people, who often have sophisticated accountants and attorneys and estate planners who are a big part of it as well. When somebody makes a big gift, it comes in a variety of different ways, and estate planning is a big part of it,” Checcio said. “The second point, however, is that big gifts lift everybody up, and there’s data that support this. You may have noticed that there have been a lot of big gifts to charitable organizations in the last five years, not just to higher education. I think these big gifts get noticed and allow everybody else to talk to other people at a higher level than they were before,” Checcio said.